The U.S. state of Connecticut is located in southern New England and faces south on Long Island Sound. Among its onshore lighthouses are two Early Federal towers (including the Five Mile Point Light shown at right) and several interesting survivors from the Pleasanton era around 1840. 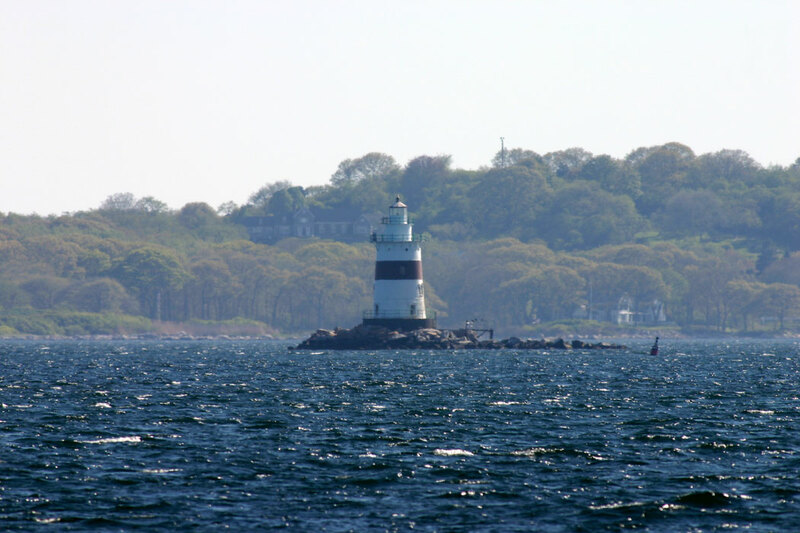 Many of the other lighthouses are located offshore in Long Island Sound. Only a few Connecticut lighthouses are open to the public. There is no state lighthouse society in Connecticut. Local interest in lighthouses is strong, but several towers are in danger or in need of restoration. 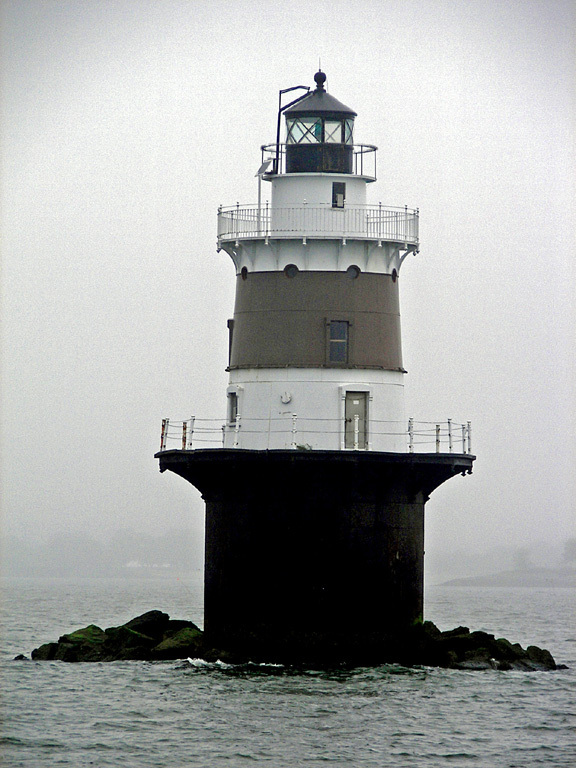 Jeremy D'Entremont's book, The Lighthouses of Connecticut (Beverly MA: Commonwealth Editions, 2005) is the indispensable reference for these lighthouses. 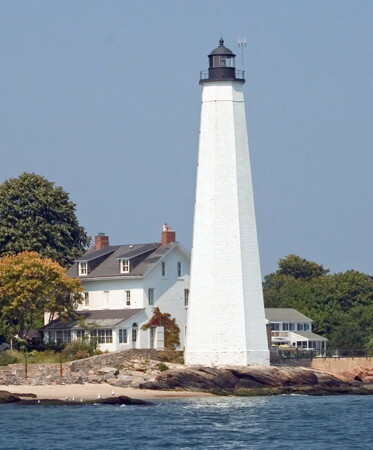 Navigational aids in Connecticut are operated by the U.S. Coast Guard First District, but ownership (and sometimes operation) of historic lighthouses has been transferred to local authorities and preservation organizations in many cases. ARLHS numbers are from the ARLHS World List of Lights. Admiralty numbers are from volume J of the Admiralty List of Lights & Fog Signals. USCG numbers are from Vol. I of the USCG Light List. Fine pictures and full information by Jeremy D'Entremont. Photos and accounts by Kraig Anderson of LighthouseFriends.com. 1840 (John Bishop). Station established 1824. Inactive since 1889. 35 ft (10.5 m) octagonal granite tower with lantern and gallery, attached church-style to a 1-1/2 story granite keeper's house. Lantern painted gray. A photo is at right, Anderson's page has good photos and a historical account, Bernd Friedrich has a closeup photo, and Google has a street view and a satellite view. The lighthouse was built with materials salvaged from the 1824 lighthouse. After deactivation, it remained in service as the keeper's house for the Stonington Breakwater Light until 1908, when a new keeper's house was built next door (that building survives as a private residence, though in greatly altered form). This is the oldest lighthouse in the country with a light tower attached in the "church" or "schoolhouse" style. The lighthouse was purchased by the local historical society in 1925 and renovated as a museum of local and lighthouse history. A 4th order Fresnel lens of uncertain origin is displayed. 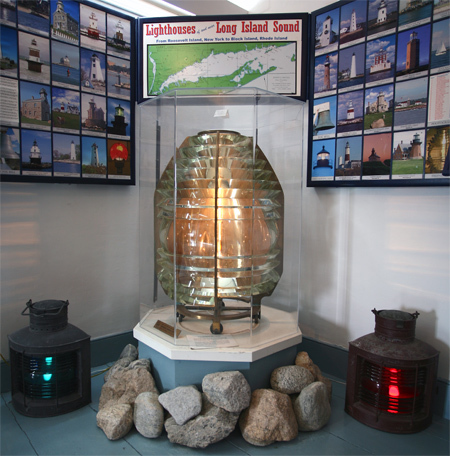 In 2001 the New England Lighthouse Lovers contributed funds to provide a protective enclosure for the lens. In March 2013 architects presented plans to restore the building and add a new visitor entrance at the back of the building with a lobby and handicapped access. This led to controversy over the necessary rezoning. In June 2015 the society withdrew its request. A more modest request led to extended zoning hearings throughout 2016. The addition was finally approved in May 2017. It's estimated that repairs to the building itself could cost $700,000. Located near the foot of Water Street, off US 1A, in Stonington. Parking available at the end of the street. Site and tower open Friday through Sunday mid May to early June and daily except Wednesdays early June through October. 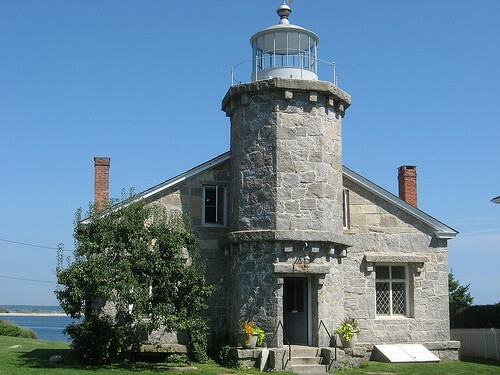 Owner/site manager: Stonington Historical Society (Old Lighthouse Museum ). ARLHS USA-813. Date unknown. Active; focal plane 14 m (46 ft); red flash every 4 s. 43 ft (13 m) square skeletal tower with a small enclosed section near the base. Trabas has a photo, and Google has an indistinct satellite view. Located on the west end of the detached outer breakwater of Stonington harbor, about 3/4 mi (1200 m) south southwest of the historic lighthouse. Accessible only by boat. Site open, tower closed. Admiralty J0664; USCG 1-20170. Date unknown (station established 1889). Active; focal plane 22 ft (7 m); green flash every 4 s. 19 ft (6 m) square cylindrical skeletal tower mounted on a square stone base. Trabas has a photo, and Google has an indistinct satellite view. Huelse has a postcard view of the historic lighthouse, a cast iron tower with lantern and gallery; it was replaced by a skeletal tower in 1926. The two lower courses of the base appear to be original. 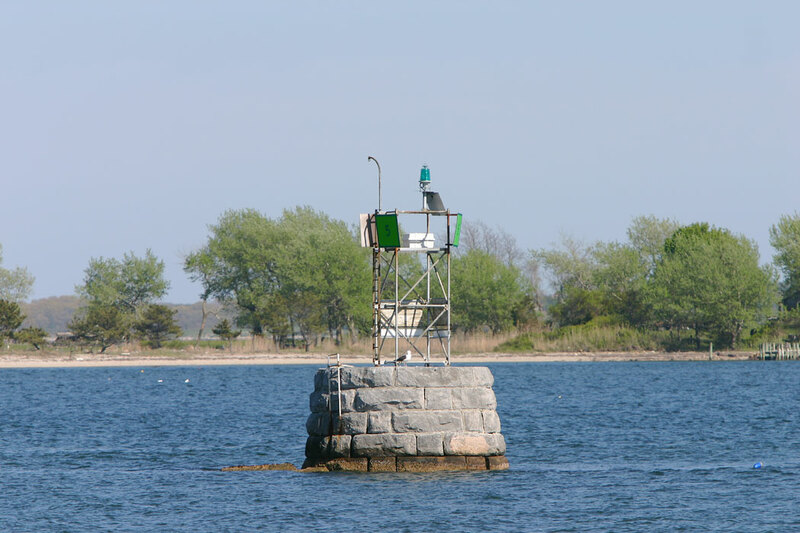 Located at the east end of a detached breakwater on the west side of the entrance to Stonington harbor. Accessible only by boat. Site open, tower closed. ARLHS USA-1118; Admiralty J0665; USCG 1-20175. 1884. Active; focal plane 55 ft (17 m); white flash every 6 s. 49 ft (15 m) round cast iron sparkplug tower (brick lined) with lantern and double gallery, incorporating 3-story keeper's house and mounted on a concrete caisson; 300 mm lens (1983). Fog bell (2 strokes every 15 s). Tower painted white with a single horizontal brown band; lantern is also white. Anderson has a fine page with excellent photos, Robert English has a 2006 photo, Dan Dionne has a 2010 photo, Trabas has a distant view, Marinas.com has aerial photos, and Google has a satellite view. 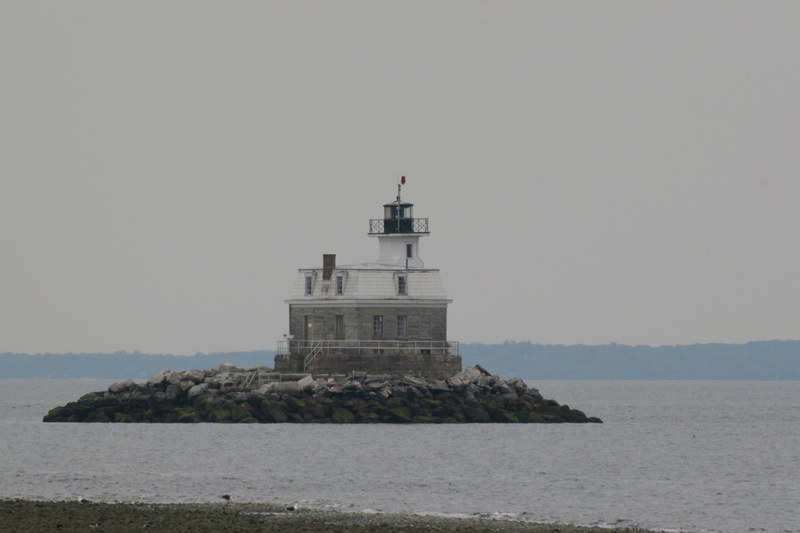 This lighthouse is a sibling of the Stamford Harbor Light in Connecticut. In 2008 the lighthouse became available for transfer under NHLPA; when no groups qualified for ownership the lighthouse was sold to Scott Phillips, the owner of a financial services company, in August 2010 for $225,000. Located in Fishers Island Sound southwest of Stonington, near the point where the borders of New York, Connecticut, and Rhode Island converge. 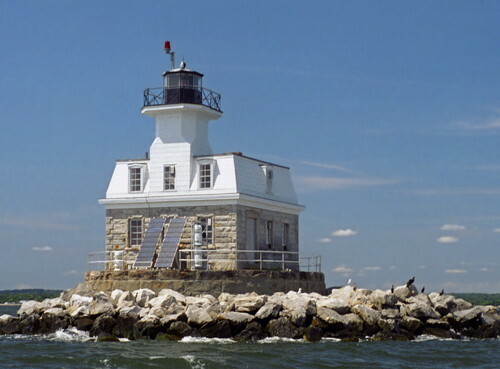 (This lighthouse is actually in New York waters, but the Directory lists it under both New York and Connecticut.) Accessible only by boat; there are distant views from the Connecticut shore. Site and tower closed. 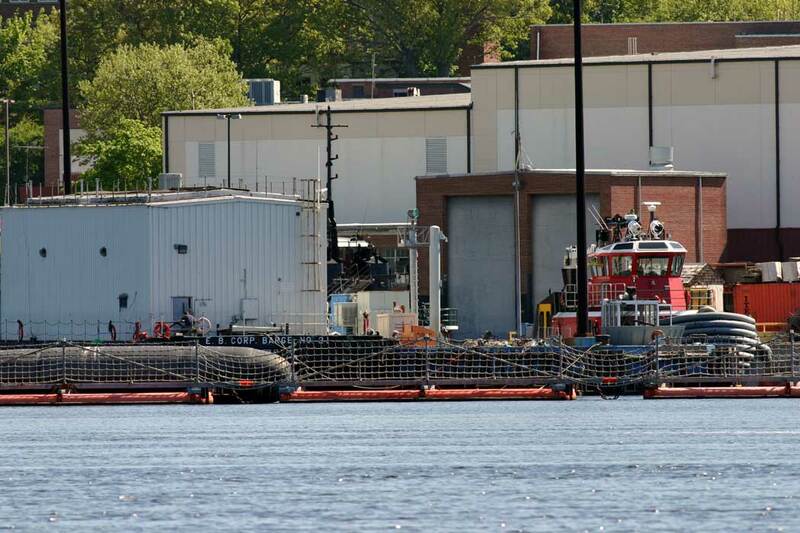 Owner/site manager: private; operator: U.S. Coast Guard. ARLHS USA-1049; Admiralty J0671; USCG 1-20085. 1966. Active (unofficial); focal plane about 8 m (26 ft); continuous white light. 25 ft (7.5 m) round wood tower with lantern and gallery: a replica of the 1901 Brant Point Light, Nantucket. A 4th order Fresnel lens, on loan from the Coast Guard, is in use. Lighthouse painted white, lantern roof black. An adjacent boat shed is a popular location for weddings and other outdoor gatherings. Seth Dewey has a fine 2010 photo, Lighthouse Digest has one of D'Entremont's photos, and Google has a street view and a satellite view. The lighthouse is part of one of America's best known maritime museums. The ground level of the tower has an exhibit on lighthouse history. The lighthouse was reshingled and restored in 2019. Located on the point jutting into Mystic Harbor at Mystic Seaport, off CT 27 between I-95 and Mystic. Site and tower open (museum admission), lantern room closed. Owner/site manager: Mystic Seaport. 1868 (station established 1831). Inactive since 1921. 52 ft (16 m) octagonal wood tower with lantern and gallery, mounted on a 2-1/2 story granite keeper's house. Light tower painted white, lantern black; building is unpainted. Anderson has a good page for the lighthouse, Gerry Guay has a photo, Dik Jenkins has a 2009 photo, and Google has a satellite view. Sibling of Block Island North Light in Rhode Island. The original lantern was removed in 1922, when the building was sold as a private residence. In 1991-92, new owners Jason and Rena Pilalas spent over $1 million renovating the lighthouse. A modern addition was made at the rear, the interior was gutted and reconfigured, and a new lantern, based on the design of the original but slightly larger, was built of aluminum. 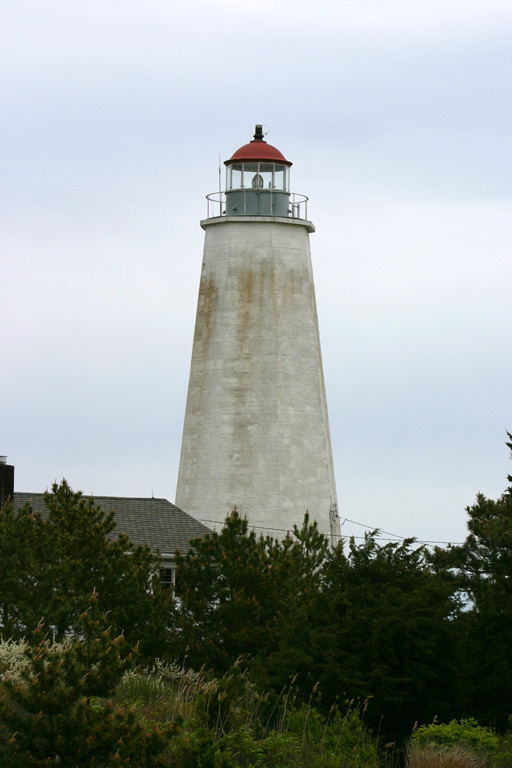 Trabas has a photo of the replacement for the lighthouse, Noank Light 5 (focal plane 17 ft (5 m); quick-flashing green light). 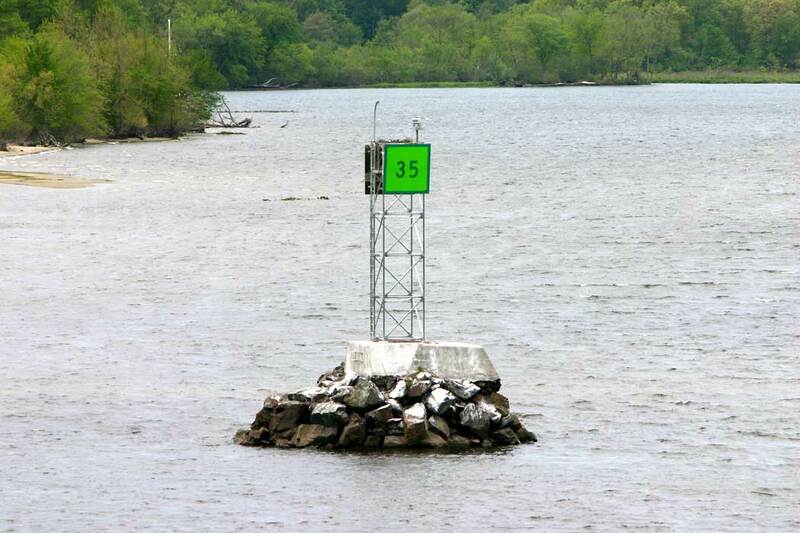 Located on Morgan Point on the west side of the Mystic River entrance in Noank. Site and tower closed; boat tours from Mystic Seaport pass the site. Owner/site manager: private. ARLHS USA-514; Noank Light 5: Admiralty J0676; USCG 1-20510. 1944. Reactivated (inactive 1967-2006, now privately maintained); focal plane 56 ft (17 m); green flash every 4 s. 55 ft (17 m) octagonal cylindrical concrete block tower with lantern and gallery. The tower is unpainted, lantern painted white with a black roof. Anderson has a fine page for the lighthouse, Paula Stephens has a good photo, Trabas has Michael Boucher's photo, Jordan Meeter has a street view, and Google has a satellite view. During World War II the property was in use as a Coast Guard training base, and trainees built the lighthouse as a memorial to lightkeepers. It was abandoned when the Coast Guard closed the base in 1967 and the property reverted to the State of Connecticut. The site is now included in the University of Connecticut's Avery Point Campus. Long endangered by neglect, the lighthouse was placed on the Lighthouse Digest Doomsday List in 1997. The Avery Point Lighthouse Society launched a fundraising campaign to save the tower. In 2001, the Connecticut legislature authorized up to $150,000 in bond funds to match contributions received by the society. The West Mystic Wood Boat Building Company offered to rebuild the lantern with no charge for labor. In December 2001 the lantern was removed for this restoration; Anderson has a photo of the tower without the lantern. The deteriorated masonry of the tower was restored during the fall of 2003. Lighthouse Digest has an April 2003 article illustrating the previous deterioration of the tower. There was a long delay in starting the rest of the restoration when University officials neglected to send in a federal grant application. Work finally began in late summer 2004 and was completed in 2006. The lighthouse was relit with a modern LED beacon in a ceremony on 15 October 2006. The preservation society has been reorganized as a chapter of the American Lighthouse Foundation. 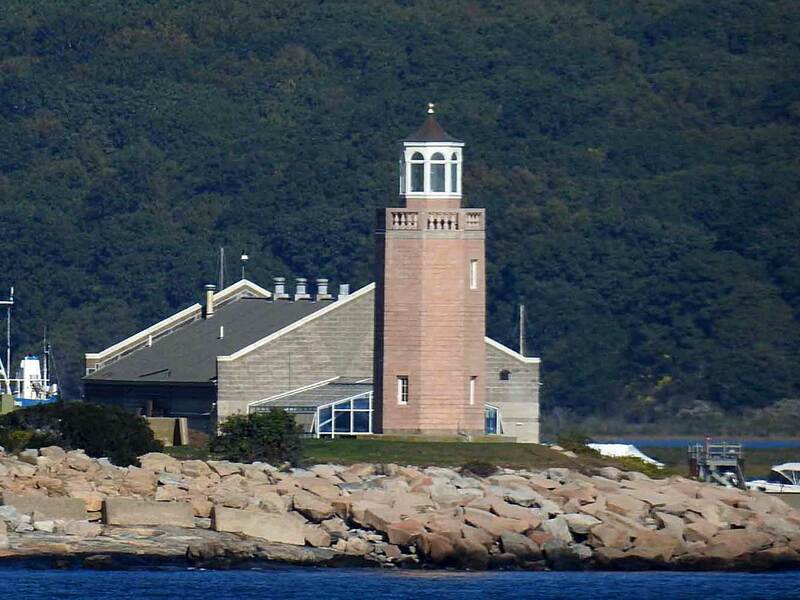 Located at Avery Point off CT 349 on the east side of the New London Harbor entrance in Groton. Parking available nearby. Site open, tower closed. Owner: University of Connecticut. Site manager: Avery Point Lighthouse Society . ARLHS USA-023; Admiralty J0730.5; USCG 1-21742. Date unknown. Active; focal plane 80 ft (24 m); continuous green light. Approx. 70 ft (21 m) square cylindrical skeletal tower with gallery. Trabas has a photo, and Google has a satellite view. The front light is on a post. Located on the grounds of the U.S. 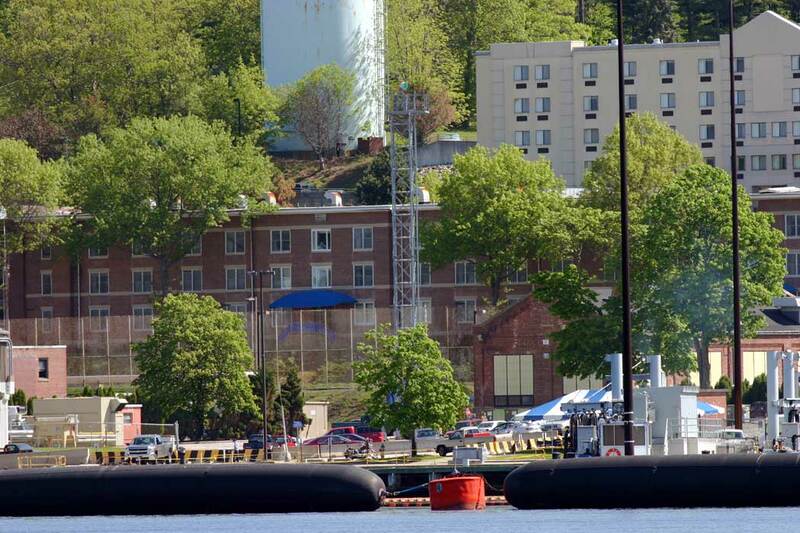 Naval Submarine Base in Groton. Site status unknown. Admiralty J0737.66; USCG 1-21960. 1909. Active; focal plane 58 ft (17.5 m); four flashes every 30 s in a complex pattern: three white flashes separated by 5 s, 10 s off, red flash, 10 s off. Round cylindrical lantern with gallery rising from the center of a 3-story square red brick Empire-style keeper's house; solar-powered 190 mm lens (1984). Fog horn (two 2 s blasts every 20 s). Lantern is white with a red roof. Alan Budney's photo is at right, Anderson's page also has good photos, Trabas has a photo by Michael Boucher, Elaine Bartholomew has a photo, Marinas.com has aerial photos, Huelse has a historic postcard view, and Google has a satellite view. A unique lighthouse and an architectural landmark. A local foundation leased the lighthouse from the Coast Guard to work for its restoration; plans were for the building to be renovated as a guest house and museum. Volunteers have worked steadily in the lighthouse in recent years, although much remains to be done. A museum has been established inside the building, with an expanding collection of artifacts. Winter storms in 2010 damaged the stairway to the lighthouse, bringing work to a halt for the year, but the Coast Guard installed a new stairway in the spring of 2011. In 2012, the lighthouse was repainted by volunteers from the crew of the submarine USS North Dakota. In 2013 the lighthouse became available for transfer under NHLPA, and in September 2014 it was announced that the New London Maritime Society would receive ownership, with the foundation continuing to lease and manage the lighthouse. The ownership transfer took place on 6 August 2015. Located in the mouth of the Thames River southwest of Avery Point, Groton. Accessible only by boat; tours are available on a variable schdeule governed by tides and weather. Owner: U.S. Coast Guard. Site manager: New London Ledge Lighthouse Foundation. ARLHS USA-542; Admiralty J0730; USCG 1-21825. 1801 (Abisha Woodward). Station established 1761. Active; focal plane 90 ft (27.5 m); white light, 3 s on, 3 s off (red sector covers dangerous shoal). 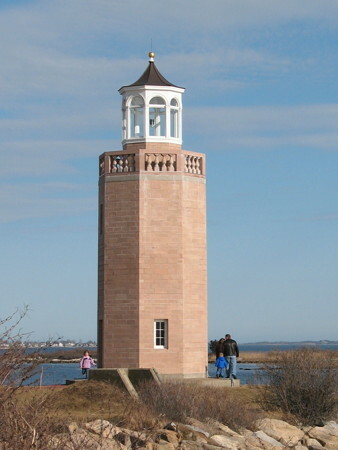 89 ft (27 m) octagonal brownstone tower with lantern and gallery; 4th order Fresnel lens (1857) in use. Tower painted white, lantern black. The 2-1/2 story brick Victorian keeper's house (1863) has been a private residence since 1928. One of D'Entremont's photos is at the top of this page, Anderson's page has excellent photos, Trabas has a fine photo, Marinas.com has aerial photos, Huelse has a historic postcard view, Google has a street view, and Google has a satellite view. This is the nation's fifth-oldest light station and the seventh-oldest U.S. lighthouse; it is both the oldest and the tallest lighthouse in Connecticut. It marks the west side of the entrance to New London harbor. In 2002 the lighthouse was repainted by the crew of the Coast Guard icebreaker Penobscot Bay. In 2005 the lighthouse was approved for transfer under the National Historic Lighthouse Preservation Act to the New London Maritime Society. After years of delays, the transfer finally took place in October 2010. The Society has a web page for the lighthouse. The first guided tours of the lighthouse took place in May 2012. A first phase of restoration, including exterior repairs and repainting, was underway in the summer of 2014. 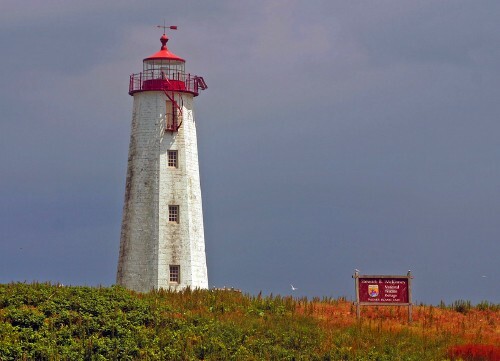 In November 2014 the next-door neighbors to the north of the lighthouse sued the society for alleged trespassing and disruptive activities, and shortly thereafter the next-door neighbors to the south (who occupy the keeper's house) took action to block land access to the light station. 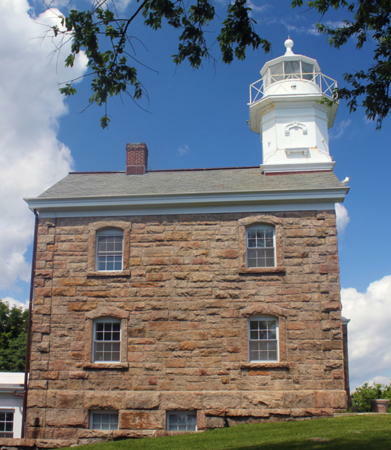 The city zoning board issued a cease-and-desist order blocking all public access to the lighthouse; the board ruled that the lighthouse cannot be operated as a museum in a residential zone. In June 2015 the Society lanched a campaign to raise $175,000 to build a dock so that visitors can reach the lighthouse by sea. The Society also proposed a special "historic property" zoning for the lighthouse, but this idea was rejected by the zoning board in May 2017. In February 2018 the Society reached an agreement with the landowners to the north, who then dropped their suit but continue to oppose lighthouse tours. Later in 2018 a Superior Court judge ruled that limited visits to the lighthouse could be permitted under zoning regulations, and in March 2019 the Board of Zoning Appeals established rules limiting visits to no more than 12 per week with no more than six persons per tour. Located at 810 Pequot Avenue south of Montauk Avenue, off CT 213 in New London, but access to the light station is difficult or impossible. Site and tower generally closed but open to limited guided tours (reservations required). Owner/site manager (tower): New London Maritime Society. Owner/site manager (keeper's house): private. ARLHS USA-541; Admiralty J0732; USCG 1-21845. 1886. Active; focal plane 58 ft (17.5 m); green flash every 6 s. 48 ft (14.5 m) round sparkplug cast iron tower (brick lined) with lantern and gallery, incorporating 3-story keeper's quarters and mounted on a concrete caisson; 300 mm lens. Lighthouse painted white with black trim. Fog horn (3 s blast every 30 s). A photo is at right, Anderson has a good page for the lighthouse, Trabas has a photo by Ronald Wöhrn, Huelse has a historic postcard view, and Google has a satellite view. 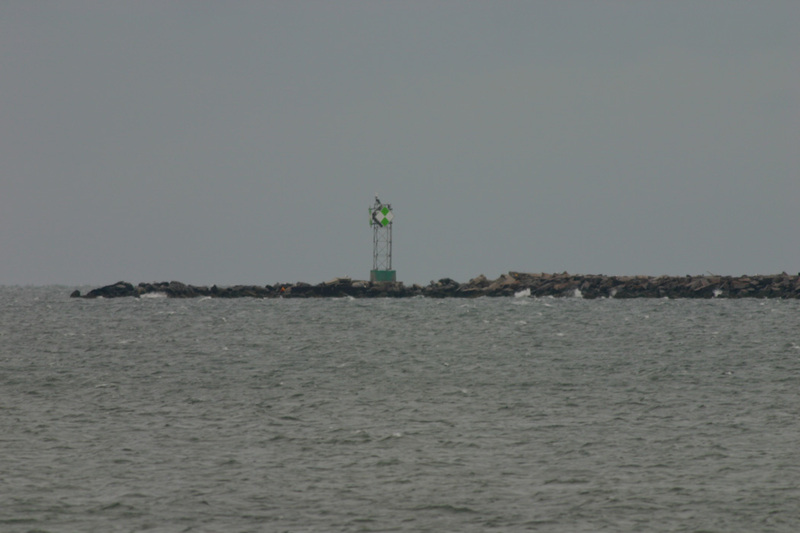 M. Hughes has an aerial view showing the breakwaters, this lighthouse, and the Lynde Point lighthouse. 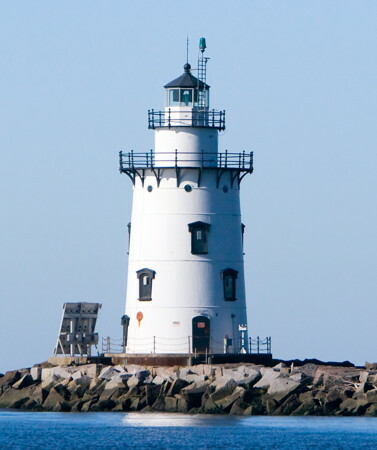 This is the lighthouse seen on Connecticut's special license plates. Sibling of Latimer Reef light. Repainted 1996. In 2007, the lighthouse became available for transfer under NHLPA, and in 2008 Beacon Preservation considered an application for the transfer. However, this is one of several offshore lighthouses where preservation efforts are currently delayed by a dispute over ownership of the underwater land on which they stand. The group backed out, and in August 2013 the lighthouse was sold at auction for $340,000 by Kelly Navarro, whose company owns two waterfront homes opposite the lighthouse. After failing to secure a long-term lease of the lands under the lighthouse, Navarro backed out of the deal in 2015. The state legislature then passed an act to authorize the lease of bottomlands under lighthouses. In August 2015 the lighthouse went back on auction, selling for $290,000 to builder Frank Sciame, the owner of the nearby estate formerly owned by actress Katherine Hepburn. Sciame first said he intended to renovate the lighthouse as a guest house for the estate. In 2016 he put the entire estate on the market for $12.8 million, but the sale was later cancelled. In 2017 he said he would renovate the lighthouse as a kids' playroom. 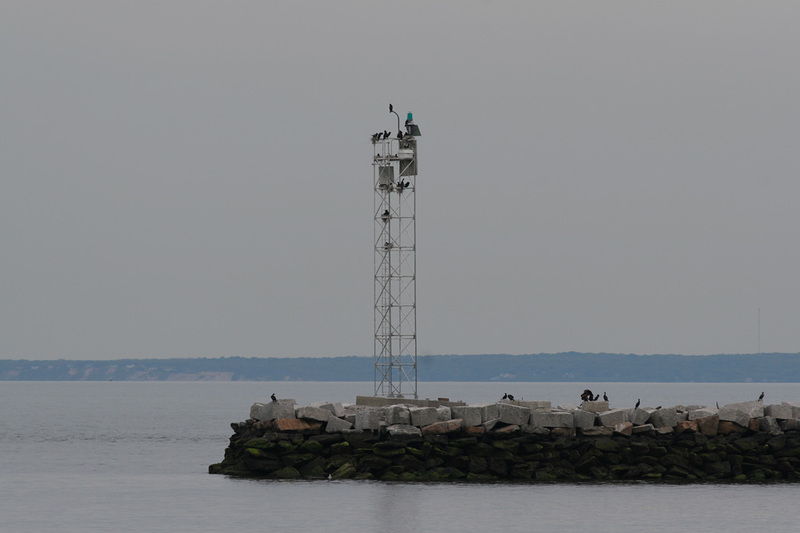 Located at the seaward end of the Saybrook breakwater on the west side of the Connecticut River entrance. Site and tower closed. Operator: U.S. Coast Guard. Owner/site manager: private. ARLHS USA-740; Admiralty J0744; USCG 1-21115(=22495). Date unknown. Inactive daybeacon. Approx. 7 m (23 ft) pyramidal granite tower topped by a mast carrying a white globe. J.G. Coleman has a distant view (fourth photo on the page, showing the Lynde Point lighthouse), and Google has a satellite view. We need information on the history of this interesting beacon. 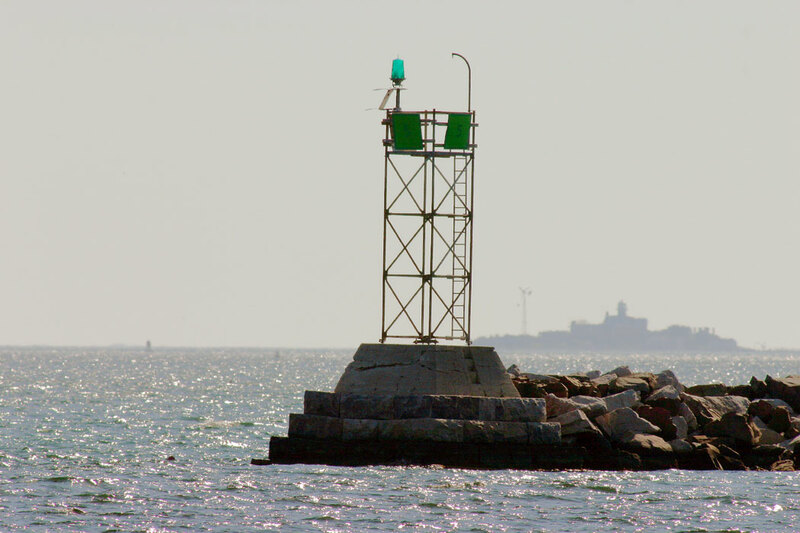 Located on the north end of the east breakwater. Accessible only by boat. Site open. USCG 1-22510. 1839 (station established 1803). Active; focal plane 71 ft (21.5 m); continuous white light. 65 ft (20 m) octagonal brownstone tower with lantern and gallery, 5th order Fresnel lens (1890). Tower and lantern painted white, roof of lantern red. The historic keeper's house (1858) was demolished in 1966 and replaced with modern Coast Guard housing. Anderson's page has good photos, Trabas has a closeup, Marinas.com has aerial photos, and Google has a satellite view. In summer 2002 the lighthouse was repainted by the crew of the Coast Guard icebreaker Penobscot Bay. The lighthouse is adjacent to a neighborhood of large homes, including the longtime home of the late actress Katharine Hepburn. Located at the landward end of the Saybrook breakwater at Lynde Point in Old Saybrook, the west side of the Connecticut River entrance. Site and tower closed (gated residential area; no public access). Owner/site manager: U.S. Coast Guard. ARLHS USA-462; Admiralty J0746; USCG 1-22520. Date unknown (station established 1889). Active; focal plane 26 ft (8 m); green flash every 4 s. 23 ft (7 m) square skeletal tower, carrying a square green daymark with the number 25. Trabas has a photo of the present light, and Google has a satellite view. The original lighthouse, a 21 ft (6.5 m) hexagonal pyramidal wood tower on a pyramidal stone crib, was demolished in 1919. Located on the west side of the river channel, off Hayden's Point and just below Essex. Site open, tower closed. ARLHS USA-1210; Admiralty J0748; USCG 1-22610. Date unknown (station established 1889). Active; focal plane 26 ft (8 m); green flash every 4 s. 23 ft (7 m) square skeletal tower, carrying a square green daymark with the number 35. Trabas has a photo of the present light, and Google has a satellite view. The original lighthouse, a 21 ft (6.5 m) hexagonal pyramidal wood tower on a pyramidal stone crib, was demolished in 1912. 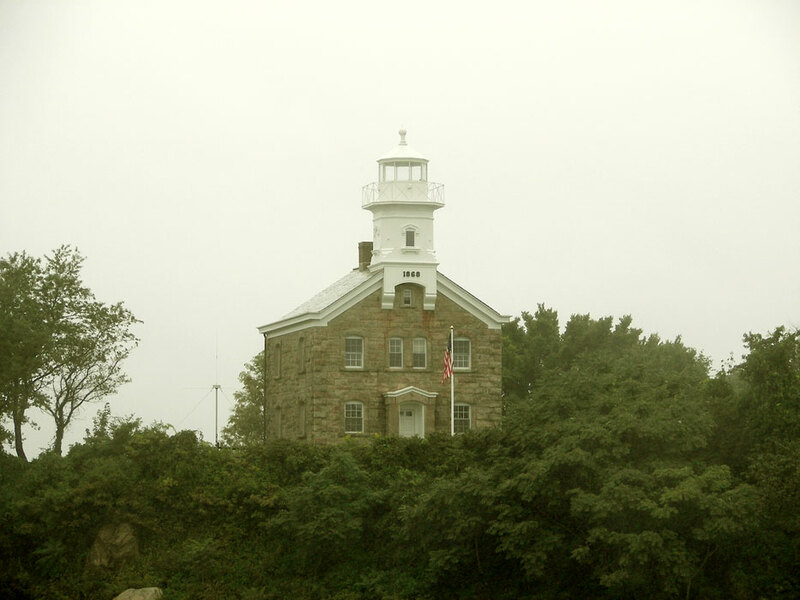 In 2000, the town of Chester hoped to build a replica of the lighthouse on the original foundation, but the Connecticut Department of Environmental Protection declined to issue the necessary permit, and the effort seems to have been abandoned. Located on a rock just downstream from Eustasia Island near Chester. Accessible only by boat. Site open, tower closed. ARLHS USA-1116; Admiralty J0751; USCG 1-22880. 1802 (Abisha Woodward). 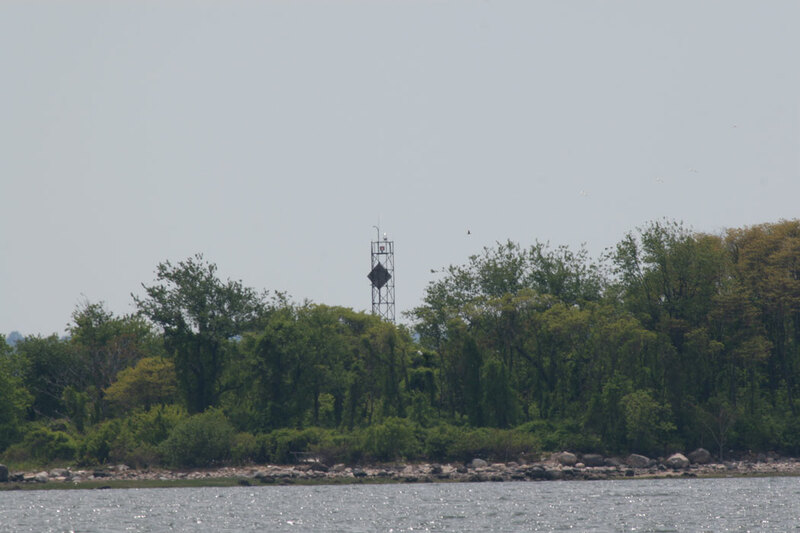 Active; focal plane 94 ft (28.5 m); white flash every 10 s. 46 ft (14 m) octagonal brownstone tower with lantern and gallery; solar-powered VRB-25 lens. The keeper's house burned in 1976 but a boathouse (ca. 1940) and brick fog signal building (1922) survive. A unique feature of this lighthouse is the stairway, which emerges from a door at the watch room level and spirals outside to the gallery. Lighthouse painted white, lantern black. One of D'Entremont's photos is at right, Anderson also has a good page for the lighthouse, Trabas has a distant view, and Huelse has a historic postcard view, but Bing has only a very distant satellite view of the island. Since 1991, Faulkner's Light Brigade has been working to save this endangered light station. A $200,000 restoration project was completed in December 1999 by the International Chimney Corporation. The first phase of a two-phase Corps of Engineers project to stop the erosion by building a stone revetment around the eastern side of the island began in Sepember 2000 and was finished in 2002. In 2007 the Fish and Wildlife Service repaired and restored the pier and breakwater at the light station. Located on a small island off Guilford. Accessible only by boat. There is an annual open house in September. Owner: U.S. Coast Guard. Site manager: U.S. Fish and Wildlife Service (Stewart B. McKinney National Wildlife Refuge) and Faulkner's Light Brigade . ARLHS USA-282; Admiralty J0762; USCG 1-21170. Date unknown (beacon dates from the 1800s). Active; focal plane 23 ft (7 m); white flash every 6 s. 23 ft (7 m) square skeletal tower mounted on a round tapered stone monument. Trabas has a photo, and Bing has a distant satellite view. 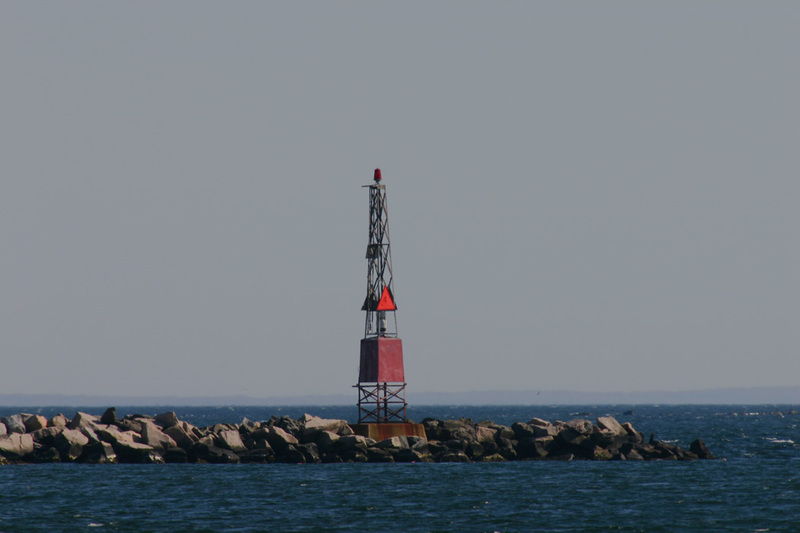 During the 1800s, Congress repeatedly passed appropriations for a "beacon or monument" on Branford Reef, but we don't know when the beacon was finally built. 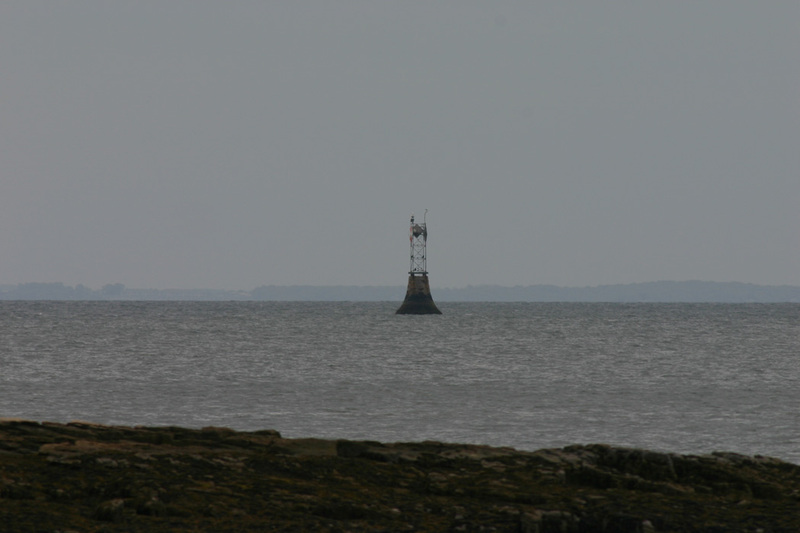 Located about 1 mile (1.6 km) offshore southeast of Branford harbor. Accessible only by boat. Site open, tower closed. Admiralty J0774; USCG 1-21185. 1877. Active; focal plane 57 ft (17.5 m); red flash every 5 s. 45 ft (14 m) octagonal Empire style cast iron tower with lantern and gallery, incorporating 2-story keeper's quarters and mounted on a concrete caisson; VRB-25 lens. Fog horn (2 s blast every 15 s). Lighthouse painted white, lantern and caisson black. Anderson has a good page for the lighthouse, Wikipedia's article has an excellent photo, and Google has a satellite view. Sibling of Ship John Shoal Light in Delaware Bay (New Jersey). The Coast Guard painted and refurbished the lighthouse in 2001. In 2015 the lighthouse became available for transfer under NHLPA. No groups qualified to receive it, and in September 2016 the lighthouse was sold at auction for $180,002 to Beacon Preservation. Funding was donated by the Werth Family Foundation and several private donors. The transfer of ownership was completed in March 2018. 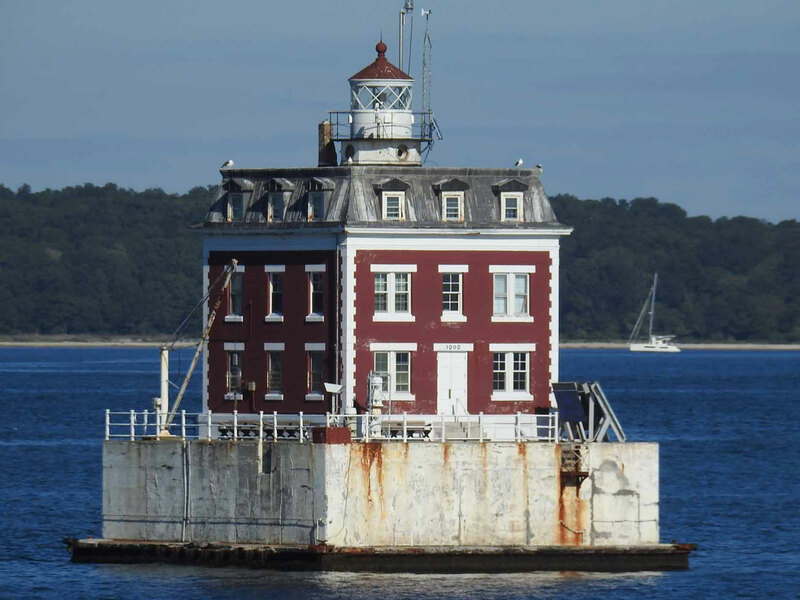 The lighthouse will be restored for use by the Werth Center for Coastal and Marine Studies at the University of Southern Connecticut and by Green Light Academy, a summer program for kids offered by Beacon Preservation. Located at the west end of a detached breakwater, about 1.2 mi (2 km) southwest of Five Mile Point in the entrance to New Haven harbor. Accessible only by boat, but there is a distant view from Lighthouse Point Park (next entry). Site and tower closed. Owner/site manager: U.S. Coast Guard. ARLHS USA-778; Admiralty J0780; USCG 1-21210. 1847 (Marcus Bassett) (station established 1805). Inactive since 1877 (a decorative mercury vapor light is displayed); charted as a landmark. 70 ft (21 m) octagonal brownstone tower with lantern and gallery, painted white; lantern black. The 2-1/2 story red brick keeper's house (1835). A historic coastal warning display tower also stands near the lighthouse. Charlie Kellogg's photo is at right, Anderson's page has several good photos, Selena Mandak has a 2016 photo, Khashea N. Alnasrallah has a street view from the beach, Marinas.com has aerial photos (identified as "Old Tower"), and Google has a satellite view. Deactivated in 1877 in favor of the Southwest Ledge Light (previous entry), the lighthouse has been owned by the city since 1922. The tower was restored in 1986. The keeper's house, currently leased as a residence, is in poor condition: Lighthouse Digest has an August 2006 article by Jeremy D'Entremont detailing this problem. Located in Lighthouse Point Park on the east side of the entrance to New Haven harbor. Site open daily Memorial Day through Labor Day (parking fee for nonresidents); tower closed except for occasional open house programs, but group tours can be arranged. Owner: City of New Haven. Site manager: Lighthouse Point Park. ARLHS USA-539. Date unknown (station established 1854). Active; focal plane 19 ft (6 m); green flash every 4 s. Approx. 15 ft (4.5 m) square cylindrical skeletal tower mounted on a square stone base. Trabas has a photo, and Google has a distant street view and a satellite view. The original light here was on an iron post; it was replaced in 1900 by an iron tower. The historic schooner Quinnipiack and the reconstructed schooner Amistad are moored at the wharf. Located off the end of the pier. Site open, tower closed. ARLHS USA-1276; Admiralty J0794; USCG 1-24205. Date unknown. Active; focal plane 65 ft (20 m); continuous green light. Approx. 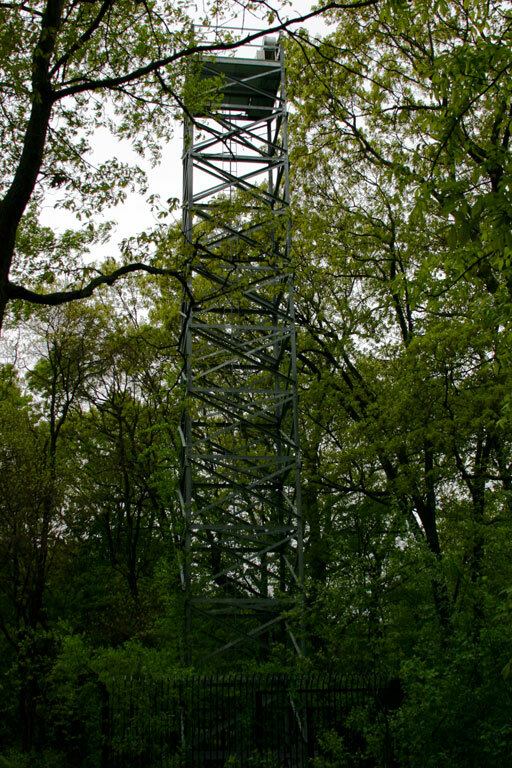 50 ft (15 m) square cylindrical skeletal tower. Trabas has a photo, and Google has a satellite view. The front light is on a much shorter skeletal tower. Located in a forested area off the south end of May Street in West Haven. Site status unknown. Admiralty J0778.1; USCG 1-24025. Date unknown (station established 1900). Active; focal plane 27 ft (8 m); white flash every 4 s. 7.5 m (25 ft) square cylindrical skeletal tower carrying diamond-shaped daymarks colored in a green and white checkerboard pattern. Trabas has a photo, and Google has a satellite view. 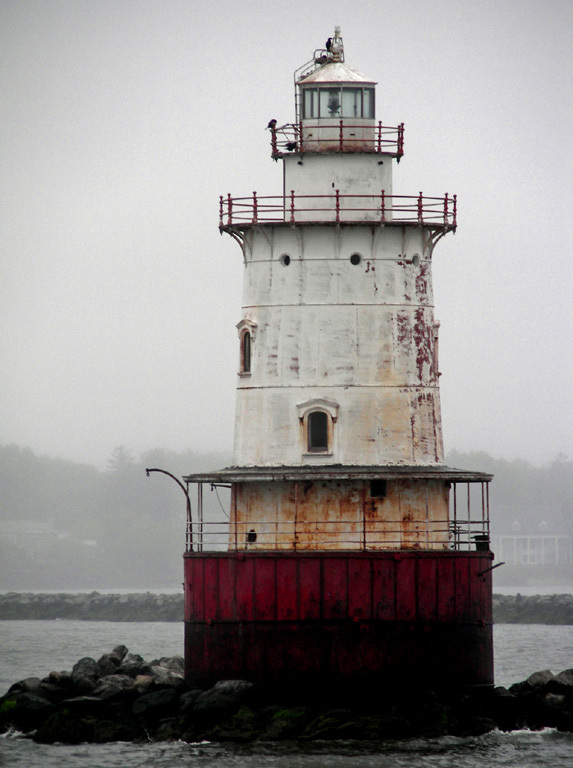 The original lighthouse was a cast iron sparkplug tower similar to the Southwest Ledge Light. Unfortunately, its foundation began to fail within a few years and the lighthouse developed an increasing lean. It was abandoned and demolished in 1933. Huelse has a historic postcard view. 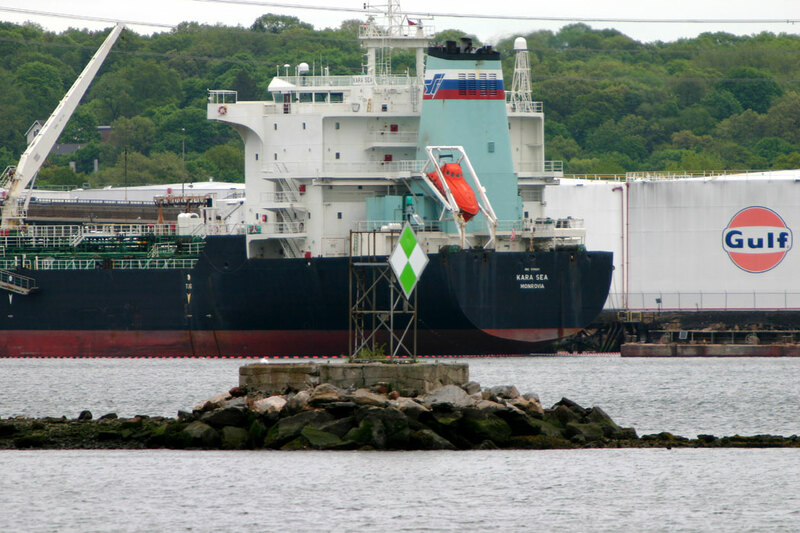 Located at the east end of the detached west outer breakwater of New London. Accessible only by boat. Site open, tower closed. ARLHS USA-1009; Admiralty J0784; USCG 1-24075. 1881 (station established 1822). Active; focal plane 52 ft (16 m); 2 white flashes every 20 s. 35 ft (10.5 m) round cast iron tower with lantern and gallery; 190 mm lens (1990). 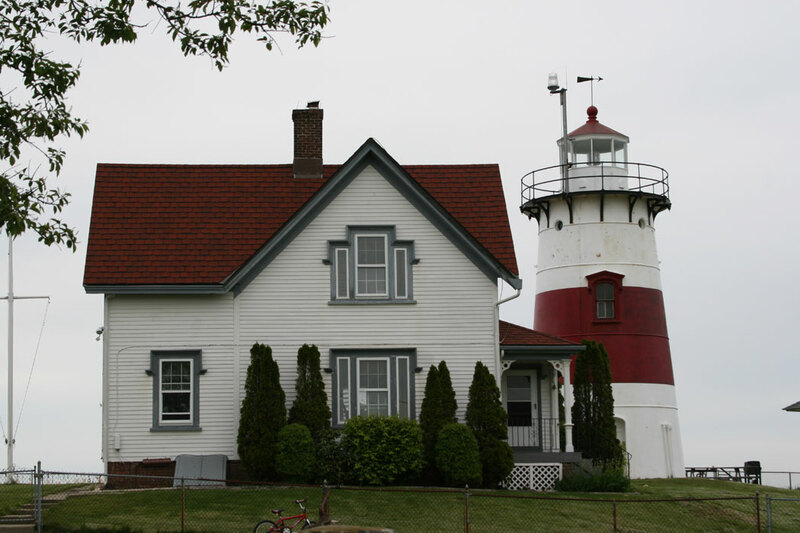 Lighthouse painted white with a broad red band in the middle; the lantern is white with a red roof. The original 1-1/2 story Victorian frame keeper's house is occupied by a Coast Guard family. Brick fog signal building (1911). Charlie Kellogg's photo is at right, Anderson has a fine page for the lighthouse, Kimberly Heilman has a 2018 photo, Trabas has a closeup photo, Huelse has a historic postcard view, and Google has a street view and a satellite view. The lantern, removed in 1969 when the light was automated, was displayed for years at Boothe Memorial Park in Stratford. In 1990, during a renovation of the lighthouse, the lantern was refurbished and returned to the tower. Located at the end of Prospect Lane, off CT 113, in Stratford. Site and tower closed except for tours offered once or twice each summer; the light can be viewed from nearby. Owner/site manager: U.S. Coast Guard. Admiralty J0810; ARLHS USA-816; USCG 1-21230. 1877. Active; focal plane 60 ft (18 m); white flash every 5 s. 35 ft (10.5 m) octagonal cylindrical granite tower with lantern and gallery, attached to the front of a 1-1/2 story granite Gothic Revival keeper's house, mounted on granite caisson; solar-powered VRB-25 lens. Fog horn (2 s blast every 15 s). Building trim and lantern painted white. Anderson's page has great photos, Trabas has Michael Boucher's closeup photo, and D'Entremont has a fine photo. Sibling of Race Rock Light, New York. In May 2014 the lighthouse became available for transfer under NHLPA. 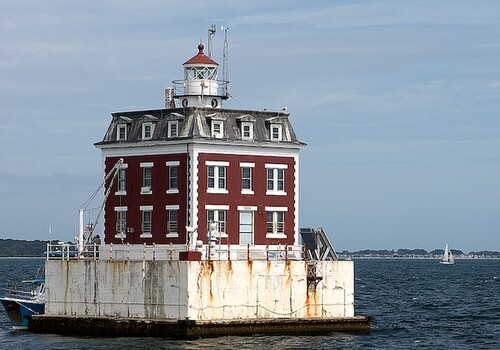 Nick Korstad, the owner of the Borden Flats Lighthouse at Fall River, Massachusetts, organized the Korstad Marine Preservation Society and successfully applied for ownership. Note: The location of the state line is somewhat uncertain, and there has been some dispute as to whether this lighthouse is in Connecticut or New York. Most maps place it in Connecticut. Located in the middle of Long Island Sound off Bridgeport Harbor. There's a distant view from the Bridgeport-Port Jefferson, New York, ferry. Accessible only by boat. Site and tower closed. Owner/site manager: U.S. Coast Guard. ARLHS USA-1010; Admiralty J0812; USCG 1-21260. 1895. Active; focal plane 31 ft (9.5 m); green flash every 4 s. 31 ft (9.5 m) round cast iron tower with lantern and gallery; 155 mm lens. Entire lighthouse painted black. No keeper's house; the light was originally tended by keepers at the nearby Bridgeport Harbor Light. Anderson has a page with a great closeup photo, Robert English has a good photo, Trabas has a closeup by Michael Boucher, and Bing has an aerial view. The lighthouse was relocated in 1919 when the breakwater was shortened by 275 ft (80 m). In 2004 the lighthouse was offered for transfer under NHLPA, but no applications were received. In March 2007 the lighthouse was withdrawn from the NHLPA process out of fears that its proximity to a power plant would make it a security risk if it were in private hands. 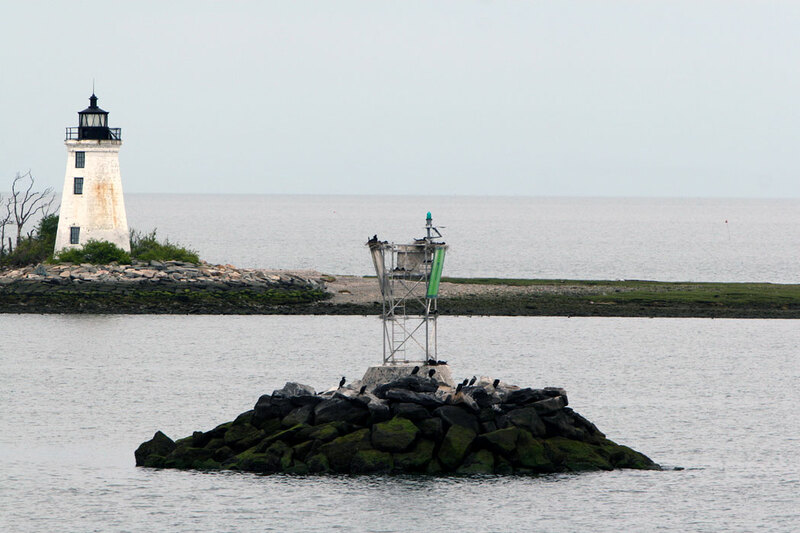 Located at Tongue Point on the west side of the Bridgeport Harbor entrance. Site and tower closed (utility company property). There are good views from the Bridgeport-Port Jefferson, NY ferry. Owner: U.S. Coast Guard. Site manager: Wisvest-Connecticut LLC. ARLHS USA-1235; Admiralty J0832; USCG 1-24635. Date unknown (station established 1851). Active; focal plane 57 ft (17 m); quick-flashing green light. 52 ft (16 m) square cylindrical skeletal tower. Trabas has a photo, Google has a distant street view, and Bing has an aerial view. Huelse has a historic postcard view of the 1871 lighthouse, which burned while being dismantled in 1953. D'Entremont has a small photo (bottom of the page) of the 1953 replacement, a 52 ft (16 m) square pyramidal skeletal tower with a small enclosed workroom in the base. 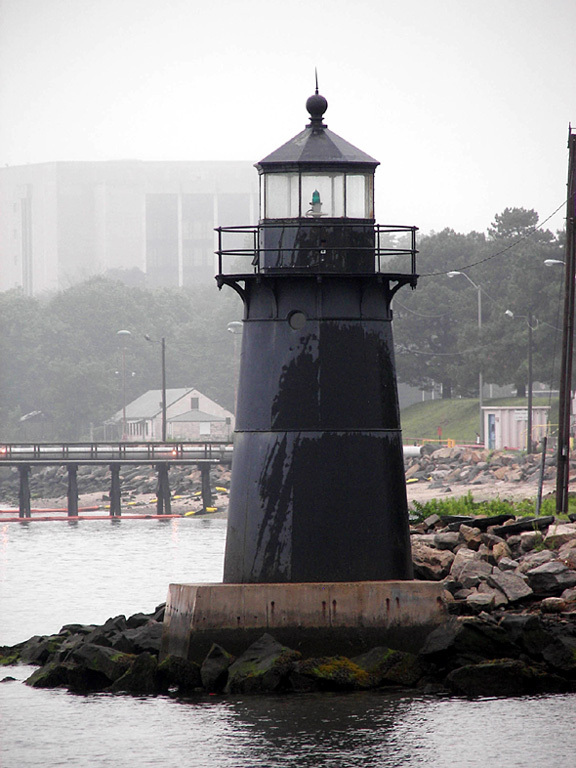 The present light is identified only as Bridgeport Harbor Light 13A. Located just inside the west breakwater at the entrance to Bridgeport Harbor, off Tongue Point. Accessible only by boat. Site and tower closed. Owner/site manager: U.S. Coast Guard. ARLHS USA-086; Admiralty J0830; USCG 1-24605. 1823 (station established 1808). Inactive since 1932 (a solar-powered decorative light is displayed); charted as a landmark. 41 ft (12.5 m) octagonal stone tower with lantern and gallery. Lighthouse painted white, lantern black. The keeper's house burned in 1977. Daniel Krook's closeup is at right, Anderson has a page with excellent photos, a photo with the Penfield Reef Light in the background is available, Trabas has a photo showing the lighthouse behind Black Rock Harbor Light 7, Elizabeth Gentile has a street view, and Google has a satellite view. Restored in 1983, the tower was later vandalized. In 1998 the Black Rock Community Council raised funds to repair and restore the lighthouse a second time and build a protective seawall. Vandals smashed the solar panels in 2004; in 2006 new panels were installed with protective wire cages. By 2010 there was increasing concern about erosion around the base of the lighthouse; preservation architects have been hired to study this problem and future restoration needs. A memorial to Kate Moore, who kept the lighthouse from 1823 to 1879, was dedicated in September 2015. Located in Seaside Park on Fayerweather Island, beyond the end of Barnum Avenue, in Bridgeport. A stone breakwater provides access from the mainland to the island. Site open, tower closed. Owner/site manager: City of Bridgeport. ARLHS USA-059. 1874 (Albert Dow, designer). Active; focal plane 51 ft (15.5 m); red flash every 6 s. 35 ft (11.5 m) octagonal granite and wood tower with lantern and gallery, rising from a 2-story granite keeper's house, mounted on granite caisson; VRB-25 lens. Light tower and keeper's house roof painted white, lantern black; granite is unpainted. Fog horn (2 s blast every 15 s). Sibling of Colchester Reef VT. One of D'Entremont's photos is at right, Anderson has a page with excellent photos, Trabas has a photo, Marinas.com has aerial photos, Wikipedia has a historic postcard view, and Google has a satellite view. This lighthouse has been endangered by lack of maintenance. In 2002 the Coast Guard made extensive repairs to the interior, including replacement of support beams and the main staircase. 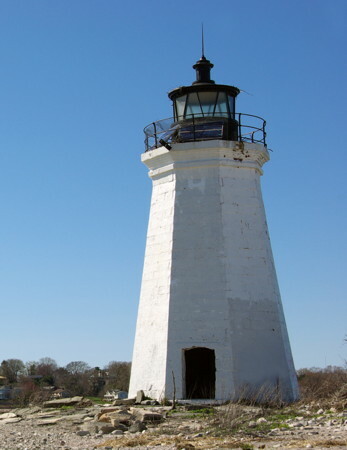 In 2007 the lighthouse was listed for disposal under NHLPA, and the town of Fairfield sought ownership. In August 2008, however, the National Park Service selected Beacon Preservation, a private group, to receive the lighthouse. The group sponsored a summer program for teenagers at the lighthouse in 2008 that included preparations for restoration. Final transfer of the lighthouse was delayed due to disputes over ownership of the bottomlands on which the tower sits. 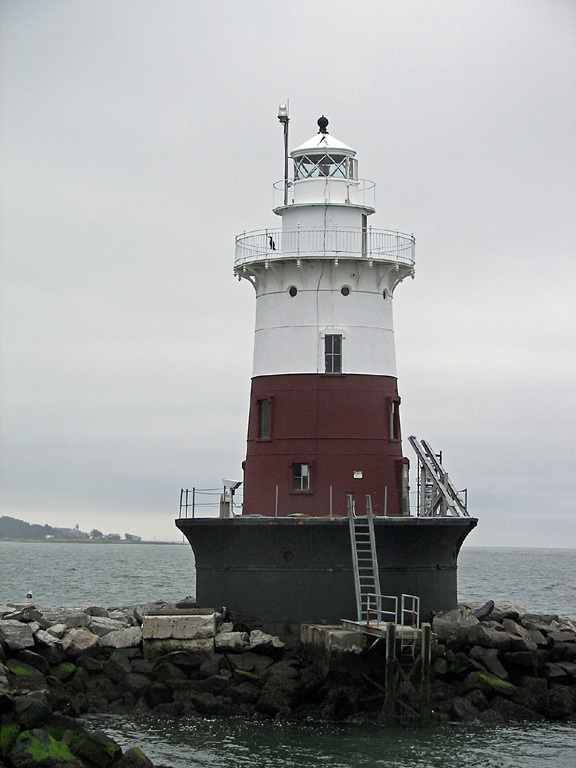 In May 2011, tiring of the legal hassles, the Secretary of the Interior announced that the grant to Beacon Preservation would be revoked and the lighthouse auctioned to the highest bidder. The highest bid was $45,000. However, a condition of the sale was that the bidder must secure the lease of the bottomlands from the state. In late 2011 the Fairfield town council moved to secure that critical lease, hoping to block sales to anyone else. A community group launched a fund drive to raise funds to bid for the light in the next auction. The sale, planned for 2013, was postponed after the lighthouse was damaged by Hurricane Sandy in October 2012. In 2014 the Coast Guard launched a major project to repair the damage. The auction sale began in July 2016, and the lighthouse sold in October for $282,345. The new owner is not known. Located on a reef about 1.25 mi (2 km) off Shoal Point, at the end of Reef Road in Fairfield. Accessible only by boat. Site and tower closed. Owner/site manager: U.S. Coast Guard. ARLHS USA-590; Admiralty J0840; USCG 1-21290. 1906. Active; focal plane 61 ft (18.5 m); green flash every 2.5 s. 54 ft (16.5 m) round cast iron sparkplug tower with lantern and double gallery, incorporating 3-story keeper's quarters and mounted on a concrete caisson; 250 mm lens. Lighthouse painted white with a broad red band, lantern and caisson black. Anderson has a good page for the lighthouse, Trabas has a closeup by Michael Boucher, Marinas.com has aerial photos (identified as "Cockenoe Harbor" after nearby Cockenoe Island), Huelse has a historic postcard view, and Google has a satellite view. The tower was repainted in 1997 but is endangered by vandalism and lack of maintenance. In 2004 the Coast Guard announced plans to shore up the lighthouse by adding 100 tons of rock around the base. In May 2014 the lighthouse became available for transfer under NHLPA. When no organization qualified to receive it, the lighthouse was placed on auction sale, and it sold in September 2015 for $235,000 to Lighthouse Preservation Group LLC, a new organization. The sale closed in June 2016. Located on a small island off the entrance to Norwalk Harbor. Accessible only by boat; distant view from shore at Calf Pasture Beach in Norwalk. Site and tower closed. Owner/site manager: Lighthouse Preservation Group LLC (Cockenoe Lighthouse Preservation Group). ARLHS USA-588; Admiralty J0850; USCG 1-24930. 1868 (station established 1828). Inactive since 1902 (a decorative light has been displayed since 2011); charted as a landmark. 44 ft (13.5 m) octagonal metal tower with lantern and gallery, mounted on a 2-story limestone block keeper's house. Light tower painted white, lantern black; the stone building is unpainted. Anderson has a good page for the lighthouse, a nice 2012 photo is available, and Bing has an aerial view. Sibling of Block Island North Light, RI. Ruins of the 1828 tower are now underwater. 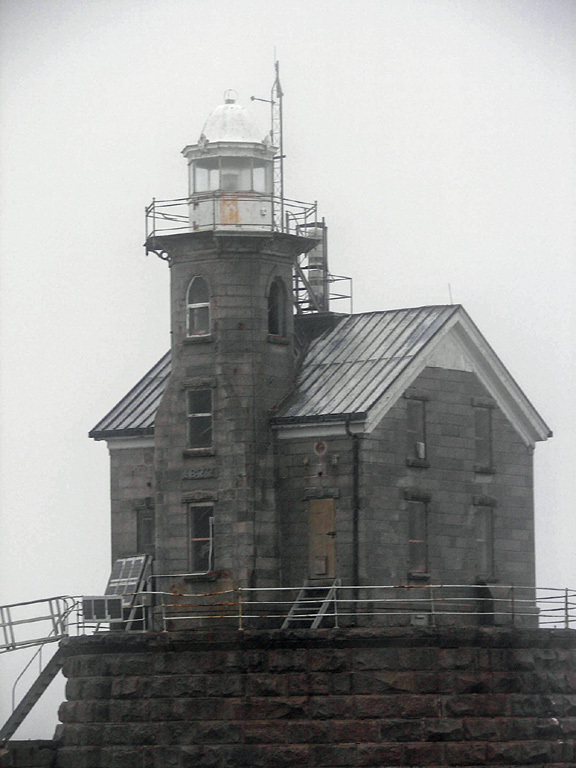 The lighthouse was deactivated in favor of the Greens Ledge Light (next entry). The lighthouse has been a museum since 1986, when it was purchased from private owners for $700,000; it has period furniture and displays on the lives of nineteenth century keepers. In 2000 preservationists celebrated retiring the mortgage on the building. 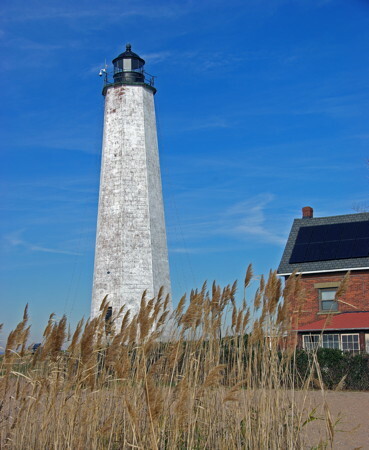 In December 2008 the state legislature appropriated $250,000 for restoration of the lighthouse, and in early 2009 funding was secured to plan the work. 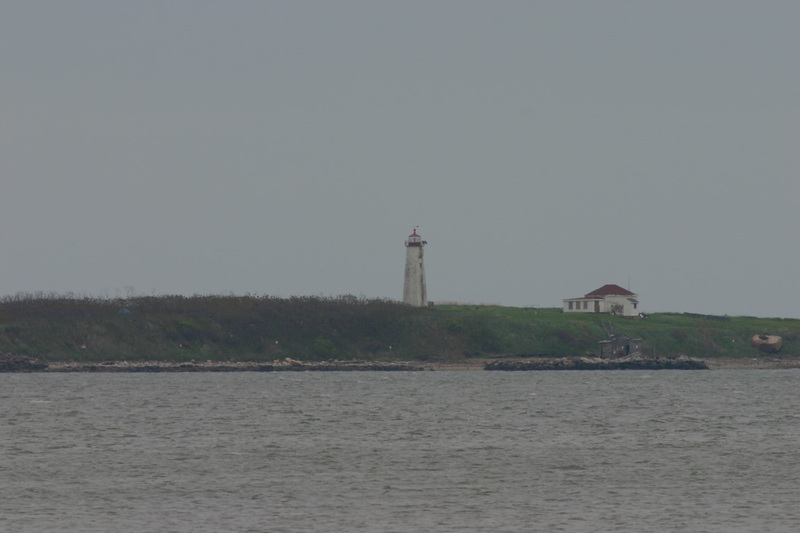 The lighthouse was relit in October 2011 with funding from NRG Energy (the light is screened so that it is not visible from Long Island Sound). 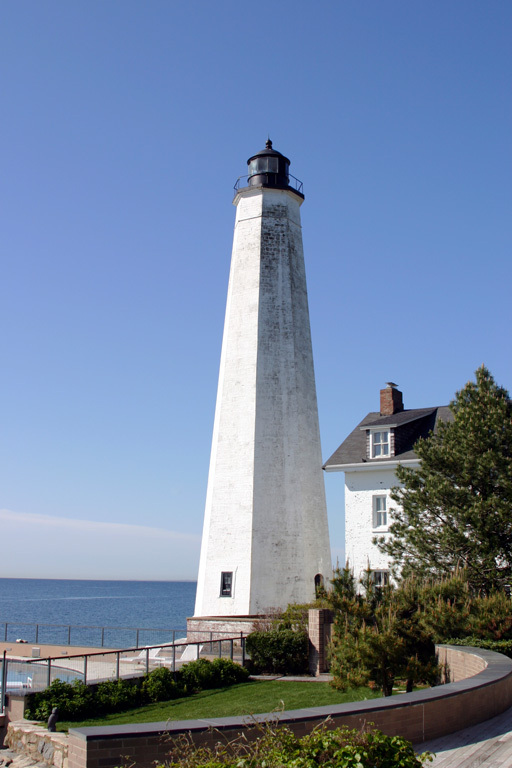 The restoration project was carried out in 2012; it included repointing the masonry, repairing cast iron, chimneys and the lighthouse tower, and repainting the lighthouse in its original gray color. 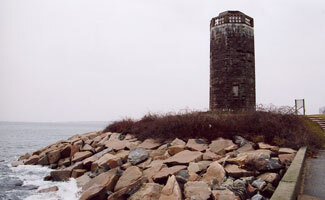 Located at the southwestern end of Sheffield Island, about 2 mi (3 km) southwest of Norwalk Harbor. Accessible by passenger ferry from South Norwalk on weekends and holidays in May, June and September and every day in July and August; otherwise accessible only by boat. Site open, lighthouse and tower open daily late May through early September. Owner/site manager: Norwalk Seaport Association (Sheffield Island) . ARLHS USA-753. 1902. Active; focal plane 62 ft (19 m); flash every 12 s, alternating red and white. 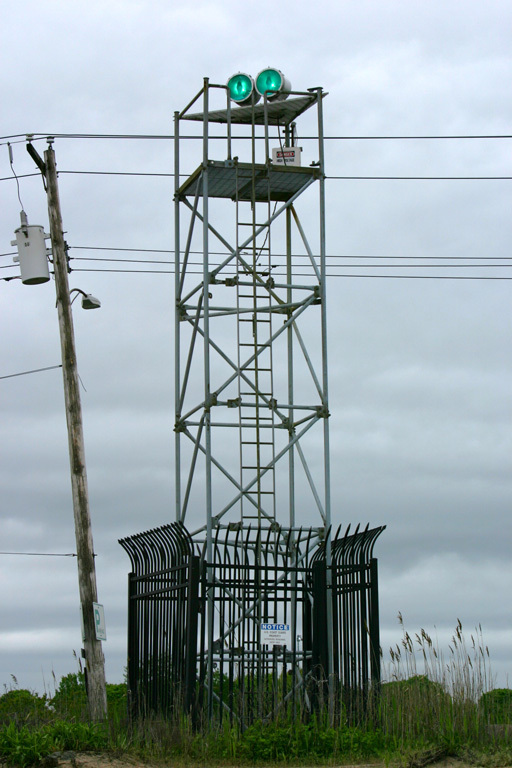 52 ft (17 m) round sparkplug cast iron tower with lantern and double gallery, incorporating 3-story keeper's quarters and mounted on a concrete caisson; solar-powered VRB-25 lens. Fog horn (two 2 s blasts every 20 s). Lower half of the tower painted brown, upper half and lantern white. Mike Dunn's photo is at right, Anderson has a good page for the lighthouse, Trabas has a closeup by Michael Boucher, and Google has a satellite view. The Coast Guard wasn't able to find a preservation group interested in taking responsibility for this lighthouse, but in 2015 it became available for transfer under NHLPA. Officials in the Rowayton district of Norwalk considered applying for ownership but did not do so. In June 2016 the lighthouse was placed at auction by the General Services Administration, and in September it was sold for $130,000 to two Rowayton residents, Brendan McGee and Tim Pettee. The new owners have formed the Greens Ledge Light Preservation Society to manage the restoration of the lighthouse, and they hope eventually to open it to the public. In May 2018 they announced that they had raised $1.5 million and would proceed with a project to build a dock and stabilize the structure. Located on a reef southwest of Sheffield Island. Accessible only by boat. Visible from the Sheffield Island passenger ferry. Site and tower closed. Owner/site manager: Greens Ledge Light Preservation Society. ARLHS USA-355; Admiralty J0866; USCG 1-21340. 1882. Reactivated (inactive 1953-1985, now privately maintained); focal plane 80 ft (24.5 m); white flash every 4 s. 60 ft (18 m) round sparkplug cast iron tower with lantern and double gallery, incorporating 3-story keeper's quarters and mounted on a concrete and cast iron caisson; 200 mm lens. Lighthouse and lantern painted white, caisson red. Anderson has a page for the lighthouse, Trabas has a closeup by Michael Boucher, Marinas.com has aerial photos, Huelse has a historic postcard view, and Bing has an aerial view. After being deactivated the lighthouse was sold no less than four times, reverting three times to the government when owners failed to meet their obligations to maintain and restore the tower. The lighthouse was finally renovated in the mid 1980s by the fourth owner, Erik Spektor, a bank executive who paid $230,000 for the light in 1984. In 1996 the lighthouse was for sale for $1.1 million, but it was taken off the market when Spektor passed away in 1998. His son Alex now owns the lighthouse and hopes to sell it to someone who can restore and maintain it. 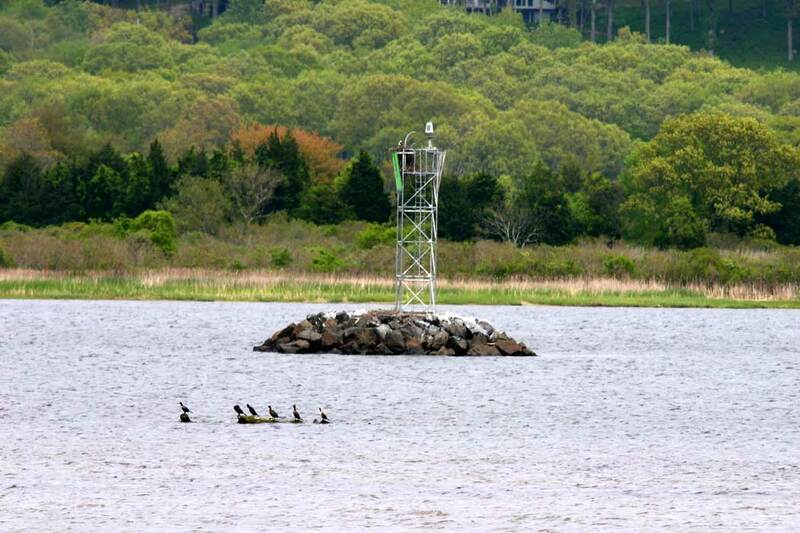 Located on a reef off the entrance to Stamford Harbor, about 0.8 mi (1250 m) west southwest of Shippan Point. Accessible only by boat. Site and tower closed. Owner/site manager: private. ARLHS USA-807; Admiralty J0890; USCG 1-25195. 1868. Reactivated (inactive 1970-2011); focal plane 51 ft (15.5 m); green flash every 5 s. 51 ft (15.5 m) octagonal granite and wood tower with lantern and gallery, mounted on a 2-1/2 story granite keeper's house. Light tower and lantern painted white. Sibling of Block Island North Light, RI. The keeper's house is occupied by a resident caretaker. Anderson has an excellent page for the lighthouse, Trabas has Michael Boucher's photo, Marinas.com has aerial photos, and Google has a satellite view. The active light was moved to a skeletal tower in 1970, and that light remains in service (next entry). The buildings were previously endangered by poor maintenance, but in September 2003 a plan was announced to restore and relight the lighthouse. The Greenwich Chamber of Commerce and the Indian Harbor Yacht Club raised $250,000 toward the restoration. After many years of delay, the Town of Greenwich awarded a $1.13 million contract in late May 2008; work was began in July and was completed in 2009. The restored lighthouse includes a 9/11 memorial and an apartment for the island caretaker. The Coast Guard decided not to move the official light back into the lighthouse but approved the additional light, and it was lit in November 2011. Located on an island about 1.8 mi (3 km) south of Greenwich harbor, close to the New York state line. Accessible only by boat; the town operates a passenger ferry from mid June through mid September. Site open, tower closed. Owner/site manager: Town of Greenwich. ARLHS USA-346; Admiralty J0905; USCG 1-21401. 1970 (station established 1868). Active; focal plane 62 ft (19 m); flash every 6 s, alternating red and white. Fog horn (2 s blasts every 15 s). 62 ft (19 m) square cylindrical skeletal tower. Trabas has a photo, and Google has an indistinct satellite view. Located beside the fog signal building of the historic lighthouse. Site open, tower closed. Owner: U.S. Coast Guard. Site manager: Town of Greenwich. Admiralty J0904; USCG 1-21400. Old Saybrook has a lovely faux lighthouse on its main dock; it displays a decorative light but is not listed as an aid to navigation. Google has a street view and a satellite view. 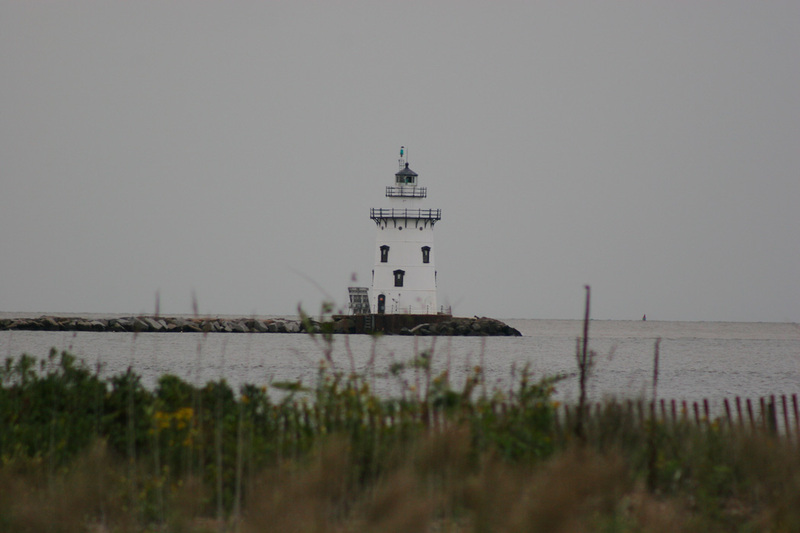 The lighthouse is available for overnight accommodations as part of the Saybrook Point Inn and Spa. Posted May 2001. Checked and revised May 15, 2018. Lighthouses: 26. Site copyright 2018 Russ Rowlett and the University of North Carolina at Chapel Hill.